Enjoying a full Canyon motor trip. Picking a river trip can be quite daunting. I think our best resource is our Rafting Trip Planning Guide. This page breaks all of our trips down into categories: motor vs. oar, when to go, hike or no hike. When someone calls not knowing what trip to do, I always start with motor vs. oar. There is obviously a big difference between the two. We do mostly motor trips at Grand Canyon Whitewater; about 80 percent of our trips are on our big 35-foot long motorboats. We usually only run about 5 oar trips per year; they book fast and are the longest trips we offer. These trips can be up to 13 or 15 days for the full Canyon; we usually see fewer families on our oar trips due to the length and pace. By pace, I mean the day to day routine. Oar trips are slower than our motor trips, literally and figuratively. You are going with the flow of the river, about 3-4 mph and you could get into camp earlier compared to motor trips. Our motor trips, on the other hand, are a faster pace where we see more families. People can sneak away for a 4, 5, 7 or 8 day trip. You can do the entire Canyon with a motorboat in 7 or 8 days (vs 13 with an oar), going about 6-8 mph through the flat water. You have the chance to get to side hike destinations quicker and can raft longer into the day. We do see more kids and families in the summer months on our motor trips, with our 7 Day Motor being the most popular. When to go is a bit of a trick question in my opinion. There really isn’t a bad time to go (and that’s not me trying to sell river trips), I really believe that. OK, here is how it works: April/May – awesome weather, cool temps and the end of the spring bloom. June/July/August – hot, hot, hot but it is our rainy season and that is a good thing. Monsoon storms often come in and cool things down a bit, or at least offer a little sun protection. September/October – season is winding down and you get those cool temps like in May. It can still be warm but the evenings can be cool. Really it comes down to time off work, kids’ schedules, etc. when picking what time of the year to go. Remember – there is no such thing as bad weather, just bad clothing choices. Hike or no hike is a big decision. But, this might be the easiest to figure out. Can you hike 8 miles, all uphill or downhill, in the heat with a loaded backpack? Some people would easily say ‘yes’ or ‘no’ without hesitation. For people who are very active hikers, soccer players, triathletes or marathon runners, hiking 8 miles might be fun. For others, “fun” might not be the first word that comes to mind. And that’s OK! If hiking for 8 hours doesn’t sound like fun, then that is totally fine (check out our 7 Day Motor trip). The most important thing is that you’re honest with yourself about your ability. We take these hike in or hike out trips pretty seriously in the office — we don’t allow them to be booked online because of that. We want to talk with everyone about their hiking ability, height and weight and their current exercise routine before we’ll let you sign up for one of these doozies. So those are some of the big deciding factors for people when they come in fresh looking for a rafting trip. Check out our Rafting Trip Planning Guide, other blogs and most importantly – give us a call! 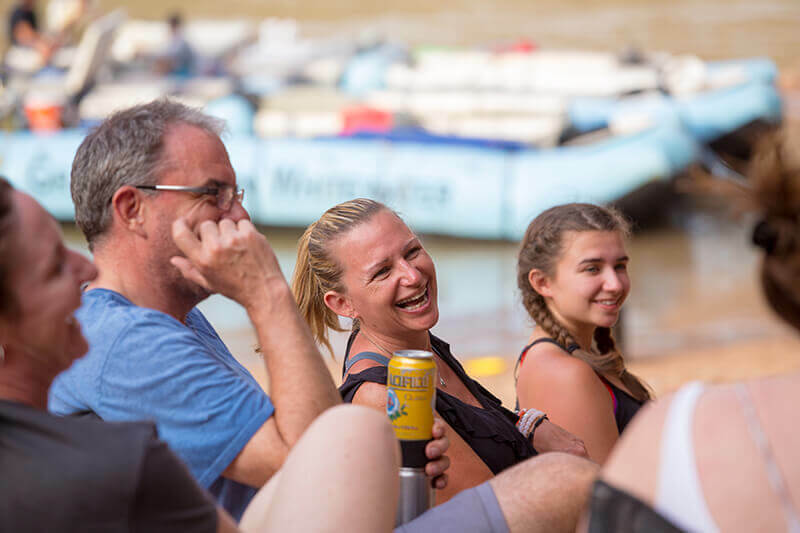 We love talking with people on the phone about our river trips and we’re always happy to help you find your perfect adventure.